Hard Work Does Not Always Pay Off – Yes or No? When you throw yourself at your job day in and out – you’d expect some recognition, yes or no? Surely you would. Unfortunately, the reality of the working world is very different. So here’s a reality check. 1. Managers often reward the people they like more often than the people who perform. They are human after all. Many managers will look for reasons to justify a good performance rating for a direct report they like, instead of ranking performance objectively. You really cannot do much about this, because these discussions usually take place behind closed doors. 2. Your manager’s definition of “good performance” may be very different from yours. He or she may simply want someone who keeps his mouth shut and does his basic work. Your boss may not appreciate the continuous improvement programs you like to initiate – even if these are clearly good for the business. Your risk taking affects your boss, who may be risk averse. Although they may take some leadership credit for a job well done, they will still fear the backlash if the job is not well done. They will remember this fear even if the project was successful. 3. Many managers do not appreciate people who are smarter than them. They may also hold a strong disillusion of their own abilities in the first place. Both these scenarios don’t well for you, yes or no? 4. HR may not think you are ready for a promotion even though they know nothing about you at all. 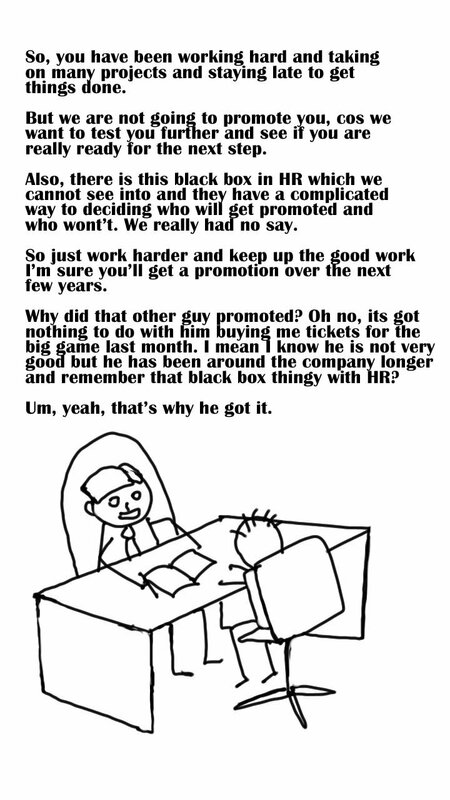 This happens a lot in organisations that try too hard to create a damn matrix of measurement for everything even something as unique as promotion readiness for roles. HR then starts waving a magical wand that blesses and curses on many factors, with actual work performance being one consideration alongside many other mundane ones. 5. Your skill set may not suit the future plans for the company. You may be a beast with Excel, but perhaps the company wants to move transaction capture into SAP. 6. Maybe you could have “played the game” better, yes ? Your Excel skills may have given the company amazing dashboards, data analysis capabilities and macros operating like they run on AI, but perhaps the company thinks Jane from accounts is more deserving, because she didn’t know enough Excel to automate her tasks, resulting in her spending way too much time in the office after hours. The management saw the hours she put in and got impressed with no idea of the incompetence inherent in her nature. In the end both jobs got done, hers and yours. Only difference being she had to work crazy impressive hours and you did it the smart way and Jane got rewarded for it. « Children Are Great- Yes Or No?